Besides some of the more obvious ones, one of the first books that I read when I found out I was pregnant was Bringing Up Bebe by Pamela Druckerman. While there are some things that I don’t think are not right for our family, there are several things that I would like to embrace. If you are not familiar with this book, Pamela Druckerman, an American, documents her experience birthing and raising children in France. One area that is quite different in France compared to the United States is healthcare. The differences are so vast there is no way to capture it in one blog post, but we will touch on one piece that I believe is helpful for all parents. Druckerman discusses a “book” that each child receives at birth to document all health related issues. In France, the doctor fills out each section (which in my opinion is awesome) and the book follows the child through adulthood. Unfortunately, that is not the way it is in the US. I have been told recently that the military healthcare system does have something similar for children whose parent(s) are in the service. What about the rest of us? For the regular folks, we are on our own. Luckily, a health record book is easy to make – harder to keep up with. 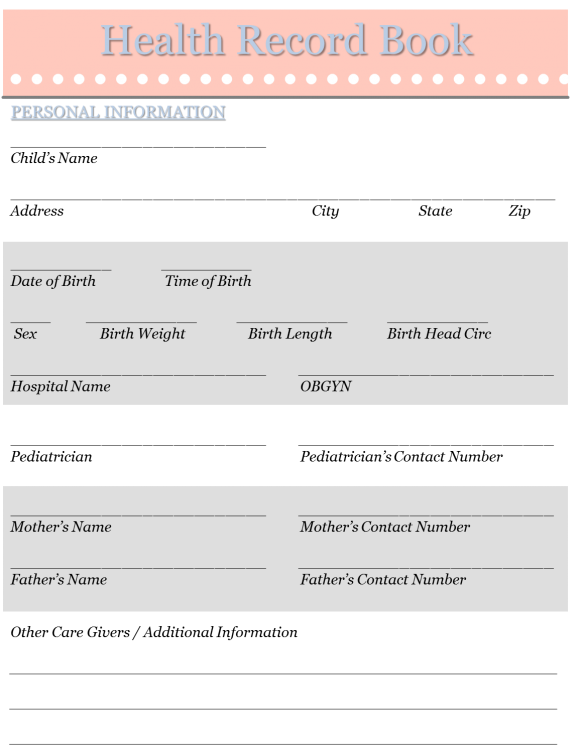 Although this specific post is aimed towards creating a baby or child health record book, you may want to start one for yourself (if you don’t have one already). In the world of technology, you would think that there would be one computer database that stores all of your health information at the fingertips of any doctor in the country, but it’s currently a private business so there is not. If you move, see a specialist, or change doctors, it’s important to know when you experienced a specific ailment or received a certain treatment. With a personal health record book in hand, you can be prepared to answer all of the questions that a doctor may have for you. This will allow the doctor to better diagnose you the first time. Ideally, for a baby’s personal health record book, it will be started at the time of birth. You will want to capture growth and development, health, illnesses, and any injuries. If you already have children, don’t let that discourage you. It is never too late to get one started. Fill out the information that you do know and add to the book from this point on. 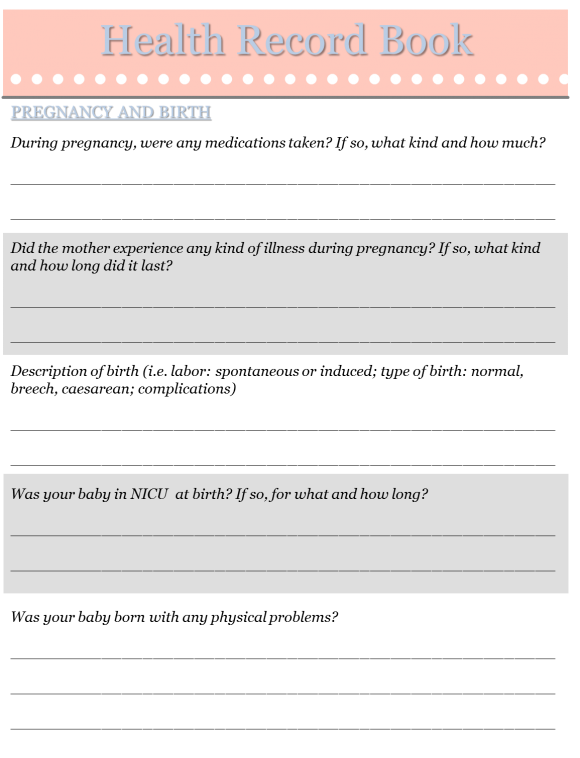 The first section of the book includes basic information about the baby or child including birth date, measurements, pediatrician, parent’s or guardian contact information, and information regarding the pregnancy and birth. The second section contains information regarding development and milestones. It has a table to record the date, age, and description of each milestone as the child reaches it. This is a good place to track weight and height as well. 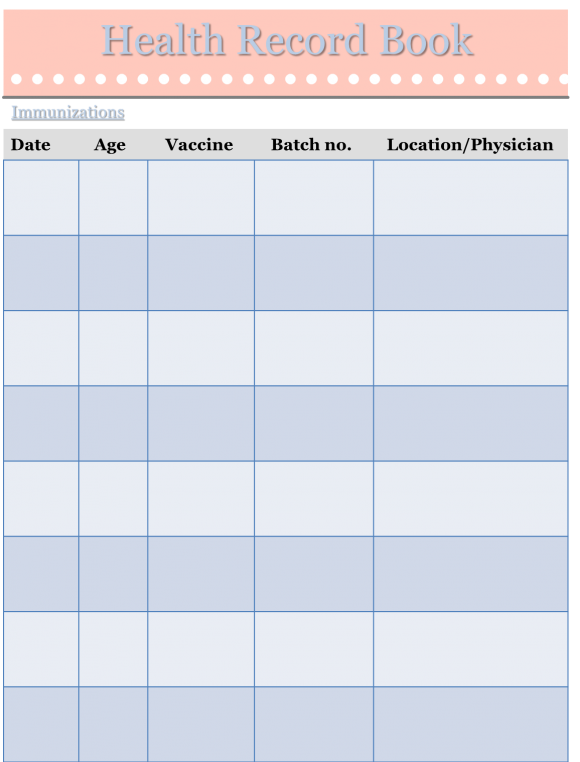 The third section is for immunization records. If you have any paperwork to go with the immunizations, you might want to include a clear pocket stored behind the list to keep all of the paperwork together. 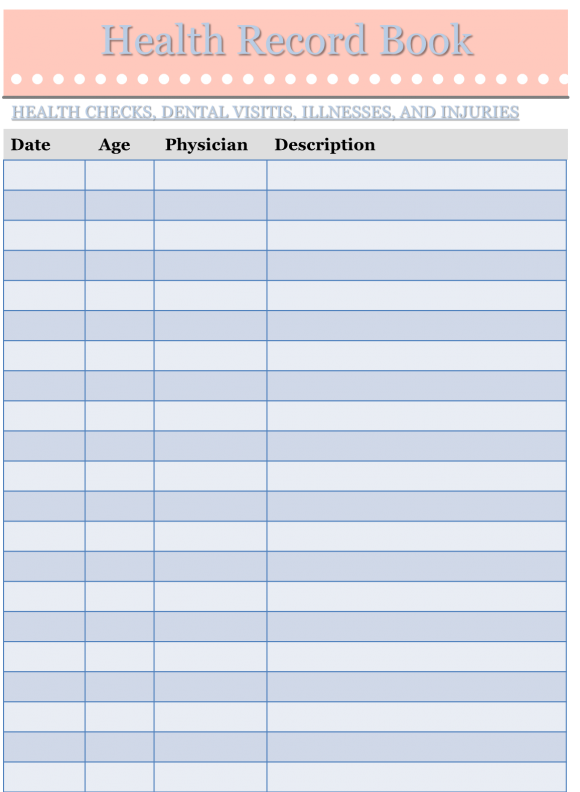 The last section is to record all of the health checkups, doctor’s visits, illnesses, and injuries. It includes a spot for the date, child’s age, physician, and description of the activity. 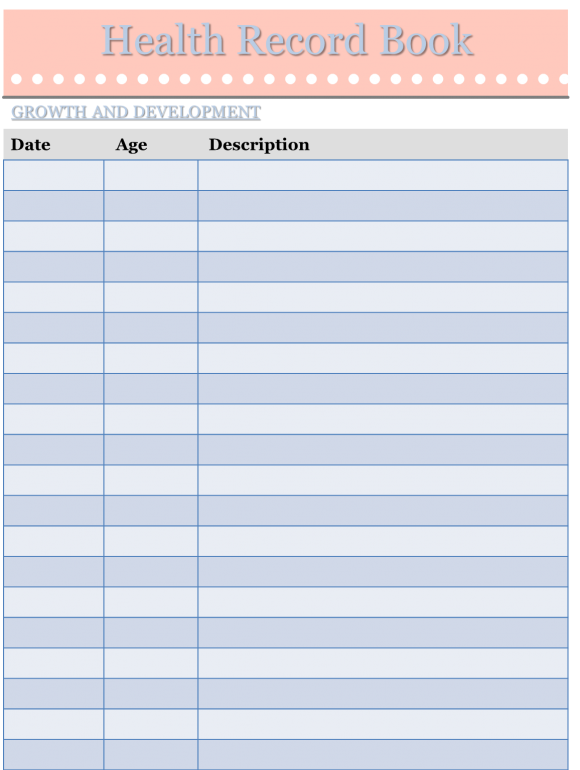 You may want to print several of these and break it out by the categories above or simply coordinate it in a way where you can easily scan it and see that a specific entry belongs to each category. To ensure accuracy, you will want to bring this book with you every time you visit the doctor, dentist, or specialist, have immunizations, enroll in school, etc. It’s hard enough pronouncing some of the medical lingo that gets repeated at a doctor’s appointment, little less remembering it that evening. With a good written record, you will always be on top of your child’s health and development.